Rock climbing is a rapidly growing sport in the United States. With the popularity of climbing comes a lot of questions about how best to go about learning the correct skills and techniques to rock climb safely and efficiently. Rock climbing guides in Truckee and Lake Tahoe can help you get off on the right foot to achieve your goals of ascending any cliff in the world. Alpenglow Expeditions provides high quality rock climbing guides in Truckee and Lake Tahoe, giving you the best chance at learning how to rock climb outdoors the right way, the first time. Many rock climbers choose to go it alone, asking friends to teach them how best to go about safely scaling cliffs outdoors. Some great courses for the first timer to check out would be our Intro to Outdoor Rock Climbing course. For families who are looking for a fun day outside together sharing an adventure experience, we recommend our Half Day Family Rock Climbing. Up to 5 members can join this fun morning or afternoon of rock climbing in Truckee or Lake Tahoe. Parents can learn how to belay while the kids get instruction on movement and technique. Experienced rock climbers interested in scaling larger cliffs will thoroughly enjoy a day at Lovers Leap with one of our rock climbing guides. Lovers Leap is located in South Lake Tahoe and offers some of the best moderate multi pitch rock climbing in the United States. When you hire a rock climbing guide you tap into their years of knowledge. Alpenglow Expeditions rock climbing guides in Truckee and Lake Tahoe have trained extensively through the American Mountain Guides Association and are certified in the discipline of rock climbing. Truckee and Lake Tahoe provide some of the best rock climbing opportunities for any ability level. Join Alpenglow Expeditions and our rock climbing guides in Truckee and Lake Tahoe to get the best education the region has to offer. 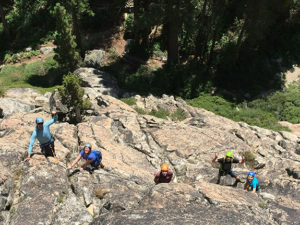 For more information on our rock climbing courses, our Tahoe Truckee adventures, or any of our other international expeditions check out our website. For any questions call our office at 877-873-5376 or send us an email info@alpenglowexpeditions.com.